Who Sold the First TV Sets Before World War 2? Who Sold the First TV Sets Before World War Two? Some time in 1938, DuMont imported sets made by Cossor to the United States. It isn't known if they were actually sold to the public, but DuMont copied much of Cossor's design (including the CRT) for use in their own models 180 and 181, probably introduced in late 1938. 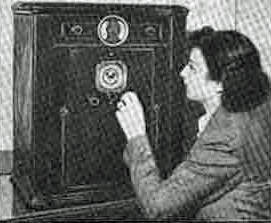 A May 15, 1938 article in Broadcasting announced that Television Corp. of America, a subsidiary of Communicating Systems Inc., announced that they were putting on sale immediately two sets, one with a 3 inch oscilloscope tube, and another with a 5 inch screen. Several articles from June of 1938 mention these sets. They also mention that DuMont had started selling sets. It is unclear if the DuMont sets are the Cossor models, or if they are the DuMont-made sets. The description of the sets doesn't match the design of the models 180 and 181, since both models had both video and sound. A November, 1938 article in Broadcasting says that DuMont is selling video receivers. These are most likely the DuMont-made models 180 and 181.